Carte blanche. The principal asked me to give a one and a half hour in-service to the newly hired staff about "communication" in our school. That's a very broad topic when it comes to the variety of kids (and teachers) that we have at our school. Being in a center-based school, however, narrows the types of students that we work with, but also reminds us how humans communicate with each other. 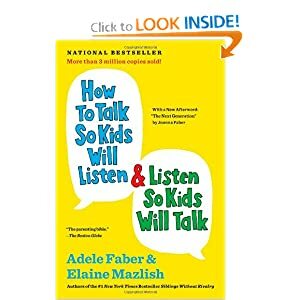 I presented a couple of years ago about how we communicate with others verbally, non-verbally, and visually using a few interesting resources: The Dog Whisperer, SuperNanny, and Adele Faber and Elaine Mazlish's How to Talk So Kids Will Listen & Listen So Kids Will Talk book. When we're talking about communication in the schools (and everywhere), we're talking about verbal, non-verbal, and visual communication. If you get a chance, the three books I mentioned above address these areas. 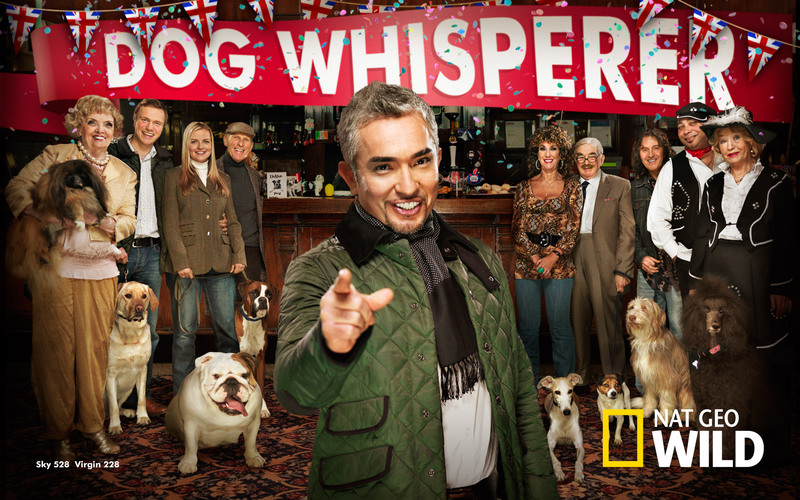 If you've ever watched The Dog Whisperer, you'll notice right away that non-verbal communication (and energy) is the most primitive way to communicate. Our energy (preferably calm and assertive), body language/positioning, and facial expressions/eye contact can determine how an interaction will go with a communication partner. Regardless of a student's expressive and receptive language skills (what they are able to say and what they understand), kids pick up on your mood, tone, and attitude. Think about it. What do your facial expressions say to the student? How about your posture? How about your personal space? Kids are constantly observing you and reading your energy. They are also reading your body language. What does your energy say about you? So, what does Cesar Milan say about your energy? Be calm and assertive. Think of Oprah and her presence around other people. Think about someone you know who has it together, yet they are able to be assertive. How do you react when a student is having a behavior problem or when they are unable to communicate? Describe. Describe what you see, or describe the problem. "There's a wet towel on the bed." Give information. "The towel is getting my blanket wet." Say it with a word. "The towel." Talk about your feelings. "I don't like sleeping on a wet bed!" Let children makes choices. Give kids the power to control their own destiny. Show respect for a child's struggle. Allow kids the ability to solve problems, but be there to support their journey for the solution. Don't ask too many questions. Facilitate and guide, but don't over do it. Don't rush to answer questions. Let kids figure out a solution. Give them time to process. My rule of thumb is to allow children 5 seconds to process and respond before giving any sort of prompt. This is difficult because we tend to expect an answer immediately. Pause. Wait. Pause. Wait some more. Give kids personal space. Don't get in their faces, but make sure you get to their level. Use pictures, picture schedules, social stories, objects, sign language (all of the above) to augment your communication. Talking to kids doesn't always work. Get creative and use your resources. I love the Supernanny! If you haven't seen the show, look it up on YouTube or Hulu. After watching a few episodes, you'll see that she immediately structures families with written rules and visual aids throughout their homes. 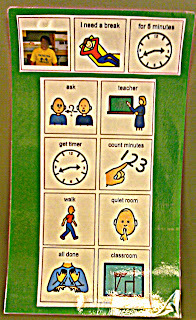 Not only do visual supports remind children of expectations, it also gives adults reminders of what they should be doing. By having these in place, the rules and structure remain consistent. Now I know Jo Frost (aka Supernanny) works with families at their homes, but much of what she teaches can be done in the classroom. These should be done as universal supports in all types of classrooms--not just students with special needs. In whatever venue you are in, visual supports assist almost everyone. In schools, students rely on supports for rules, schedules, expectations, and following directions. In rehab/nursing facilities and hospitals, written schedules (white boards) help keep patients oriented and give them the comfort of knowing what is expected in terms of appointments, therapy schedules, and medication times. 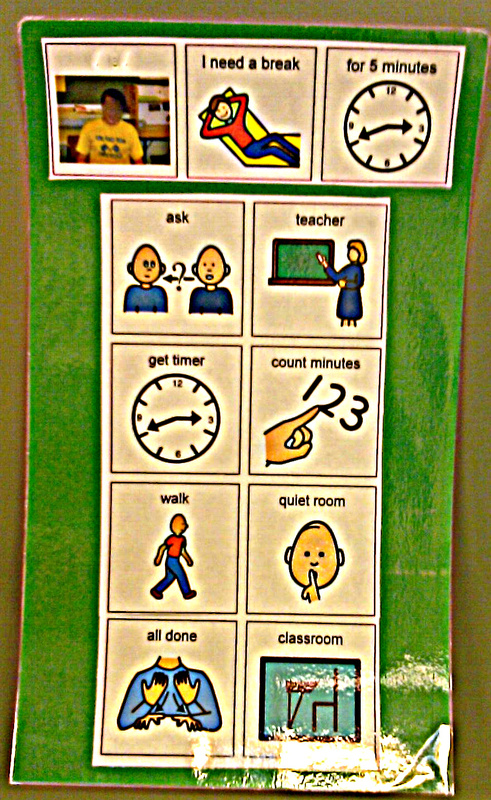 If there is one thing that we preach at our school, it is that visual supports are an expectation in all environments. Use first/then cards, visual timers, daily schedules, social stories, or anything else you can personally create to make communication better! By making conscious efforts and keeping in mind the various communication methods discussed, communication can make life easier for all!